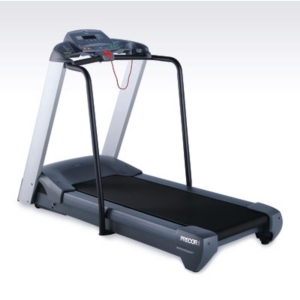 The Precor M9.31 treadmill is the mid-level treadmill Precor offers at $3,000, but it maintains the high quality and durability the company is known for. The Precor M9.31 weights nearly 285 pounds, so this thing isn’t going anywhere. It’s rock-steady and built to last. You won’t feel any vibration or wobble no matter how hard you push this treadmill. 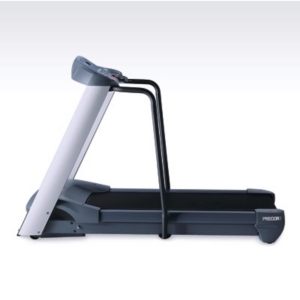 UPDATE: The Precor M9.31 has been discontinued and is no longer available. Check out the latest Precor treadmills at the company store to find a comparable model on sale. Also, make sure you take a look at the selection here as they often have really great deals on new and old models. All the fitness people love Precors and want one for their own homes. While many recommend the M9.31 model as the perfect in-home treadmill, others suggest upgrading to the M9.33 to get the additional program variety. Owners will tell you that you can’t tuck a Precor into a corner or fold it out of the way. These are serious work-out machines and take up some floor space. We like the Precor M9.31. The 2.75 HP continuous duty motor is more than powerful enough for a great workout, and the running belt area is extremely generous. With the attention to engineering details that provide safety and comfort, you won’t find a treadmill you’ll enjoy using more than a Precor. Maintenance is also easy – the solid phenolic running deck can be reversed for double the life, and it never requires lubrication. With a ten year parts warranty you’re getting a virtually worry-free machine in the Precor M9.31 treadmill. UPDATE: Spring Treadmill Sales are going strong! Rave or rant about the treadmill you bought or used at the fitness center. Read reviews submitted by others.